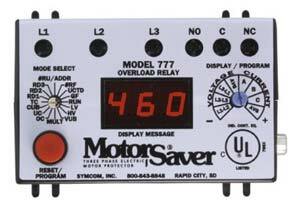 Model 777 is a fully programmable electronic overload relay designed to monitor three phase systems. It can be used as a stand alone product or the communication port can be used to form a network and monitor the motors from a laptop or desktop computer. The Model 777 includes three built-in current transformers (CTs) which will handle applications from 2-90 FLA. External current transformers can be implemented to handle applications up to 800 FLA. The following 16 parameters can be viewed from the three digit alphanumeric LED or from a network computer: low voltage set point, high voltage set point, voltage unbalance set point, CT size/Loops setting, over current trip point, under current trip point, current unbalance trip point, trip class (5, 10, 15, 20, 30), Rapid Cycle Timer (RD1), Overload Restart Delay (RD2), Underload Restart Delay (RD3), number of starts after an overload, unbalance, single phasing (manual or automatic), RS485 address, number of restarts after an underload fault, underload trip delay, and ground fault trip point. Individual line voltages and current levels, as well as average voltage and average current can also be viewed while the motor is running. The Model 777 is equipped with a RS485 port allowing up to 99 Model 777, 77C, or Model 601 units to be linked together. From the computer, an operator can control the motor, view the operating parameters, view the last faults by time & date, or log information. Software and RS485 module sold separately. SymCom, Inc., 2880 N. Plaza Drive, Rapid City, SD 57701. Tel: 605-348-5580; Fax: 605-348-5685.